I had been struggling to dig drain pipe trenches for several weeks with very little progress. The task took exhausting pick and shovel work because of our stony clay soil up here on the Floyd County plateau. Even with the help of my visiting relative, Jack Sharkey, our progress was nothing to write home about, so I decided to up the ante and employ a Ditch Witch or find someone who could use one to finish the trenches in one day. I could not find a trenching contractor in the Floyd County area although several people told me that there were people they had used for years. These contractors have perfected the ability to stay below the radar and are not listed in the phone book and if there is phone number available from friends, it is answered by an anonymous answering machine that gives no information about the person you have called. I called a regional equipment rental service and they had Ditch Witches to spare. I drove over to Christiansburg and the good guys from RCS offered me a choice of two walk-behind Ditch Witches after asking me questions about the terrain I would be trenching. I chose the Ditch Witch that had the most rock teeth on the digging chain over the more powerful machine that was also steerable. This was probably a mistake as getting a Ditch Witch repositioned is a two man job at times. The long and short of the story is that renting a Ditch Witch is a prudent investment. I dug 80 feet of 4 inch wide and 16 inch deep trench in about four hours in rocky clay soil. My rental cost was $159/day and that included the trailer it came on. The downside for anyone who might want to do the same is that the Ditch Witch will not ditch up a grade. A five degree grade was too much for the machine I rented. On the level or downhill, the ditcher would dig the trench at a rate of about one foot every five minutes. This was because of the small size of the machine and the stony clay we were trenching. There are larger machines available and if you have rocky soil, I suggest that you rent the largest machine available in your locality. If you are doing this by yourself, get a machine that steers. 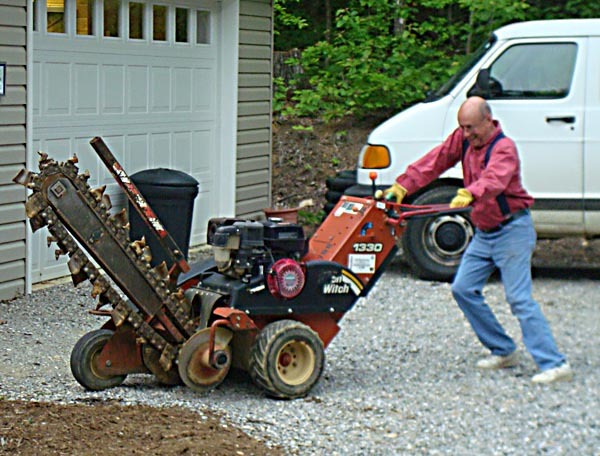 The machine I was using was like a 400 pound Rototiller so getting it to change direction was a matter of rocking it back on its two back wheels and trying to get it to swivel around. Once I got it rocked back, I did not have enough traction to swing the machine around. I had Jack Sharkey heave on the handles to get the needed course changes. Bottom line: Ditch Witches are invaluable tools. Get one that is large enough for the job and that steers. 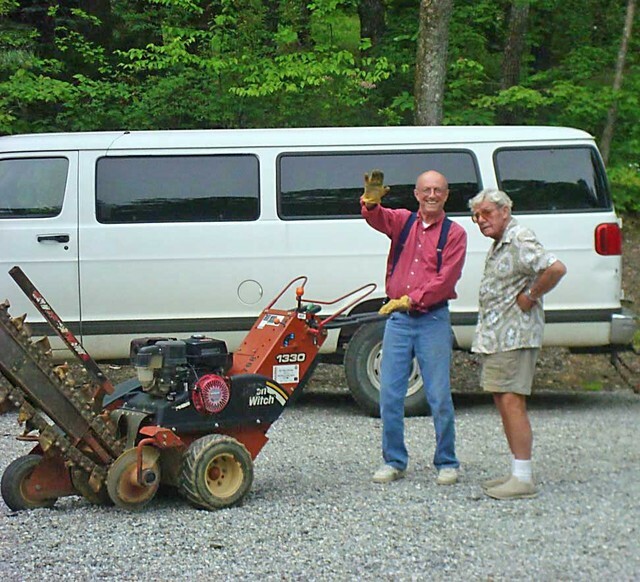 This entry was posted in Country Living and tagged Ditch Witch, Floyd County Virginia, Jack Sharkey, RCS. Bookmark the permalink.